Kids at Conrad Elementary School took part in the Terry Fox Day. School kids in Prince Rupert participated in the Terry Fox Day on Sept. 29 to help raise awareness about the Marathon of Hope. Oct. 7, 2016 4:00 p.m.
Fresh off the community-wide 2016 Terry Fox Run in Prince Rupert, which raised a region-best $27,000 for the Canadian Cancer Society’s cancer research initiative, the cause is back at it, but with miniature participants. 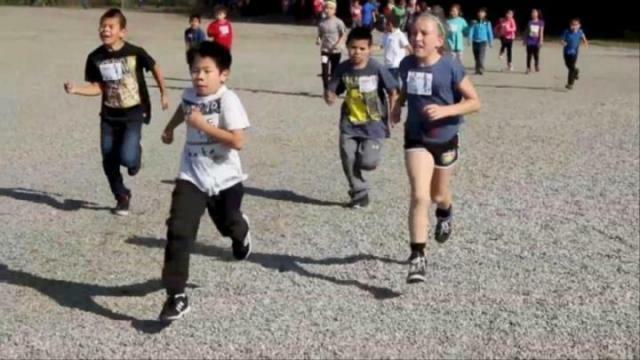 Intermediate and primary students at Conrad Elementary School in Prince Rupert took to the playground last week in support of the Terry Fox Run. “It’s not competitive at all, but it’s in the same spirit,” said learning services teacher Kim Bains. The kids learned who Terry Fox was and why the cross-Canada runner was a national hero. The school physiotherapist helped the kids warm up by organizing them to spell out ‘Terry Fox’ with their bodies, and stretch before running circuits around the playground. The event took donations for the Terry Fox Foundation from teachers and parents.